A bachelor’s degree in business is a great career move. Check out business schools with the highest salaries for graduates. PayScale defines a Business School as a college that grants more than 50 percent of their undergraduate degrees in business, accounting, entrepreneurship, finance, human resources management, management information systems and marketing, based on data reported to the Department of Education. This definition focuses on schools with strong business programs, not just schools that offer business programs exclusively. Many other colleges offer undergraduate business majors, but this list focuses on schools where the majority of alumni graduate with a degree in a business-related field. Business can be a lucrative field of study and majoring in business during your undergraduate education can lead to a high-paying career, but you must choose your college wisely. 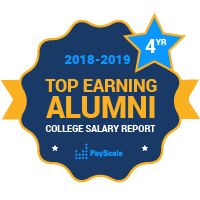 PayScale’s College Salary Report has the data to help you choose a college where alumni go on to earn high salaries and have successful careers.